Formula E, the biggest international motorsport event ever held in Hong Kong, took place on the 9 October, 2016 at Central Harbourfront. The inaugural event was part of the third season of the FIA Formula E Championship, the world’s first fully-electric racing series. Set against the iconic skyline, the championship took ten teams throughout Hong Kong on an exhilarating temporary street course. Arena Hong Kong and Asia Tents Arena were entrusted to build approximately 11,500 m² of temporary structures for this international event. The team installed a 50m x 120m EMOTION Club structure to hold 2,000 people. 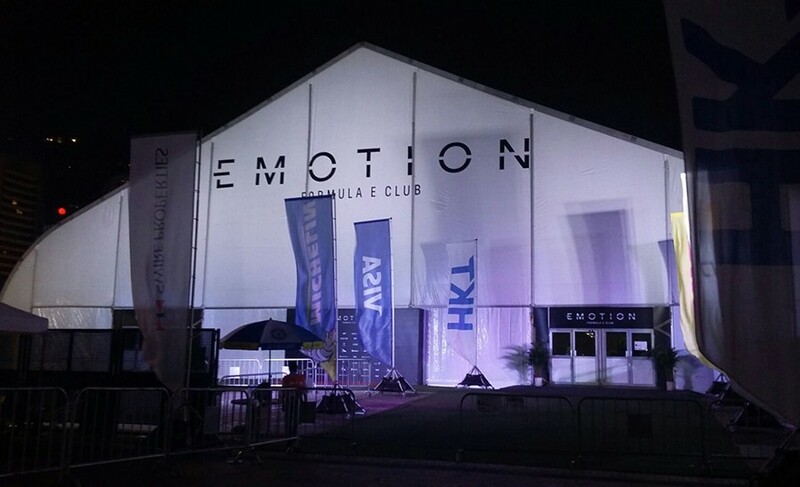 The exclusive EMOTION Club and corporate suites gave guests the ultimate Formula E experience including a pre-race World Champion MMA match, ZoukOut dance music festival and the “Battle of Victors” boxing event. Arena also provided various clearspan structures for pit lane garages, media centre, TV compounds, sponsorship and operations. Level flooring, glass wall, liners, lighting and air conditioning were customized to the structures.